A Wendy's employee appears to be taking a mouthful of Frosty frozen treat. The Taco Bell shell-licker has nothing on this guy. 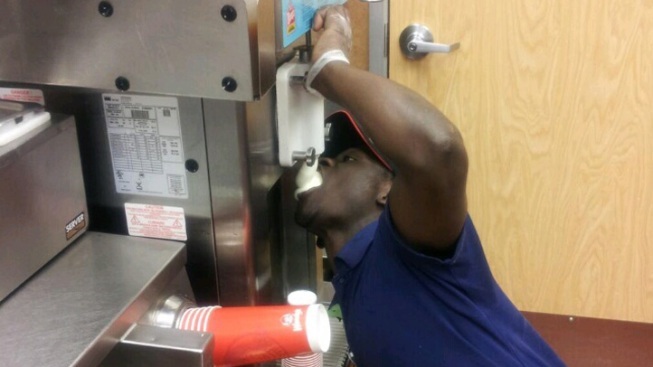 A photo circulating on Reddit shows a Wendy’s employee inhaling a mouthful of the fast-food chain’s Frosty frozen treat straight from the dispenser. The folks at Wendy’s have taken notice and said in a tweet early Friday that the employee is no longer with the company. @matthiashow@CassandraYoung Unacceptable. The person in this photo is no longer at this Wendy's. We will be reinforcing proper procedures. Last week, a Taco Bell worker seen licking a stack of taco shells was fired after a photo of him in action was posted on the company's Facebook page.